A cobalt 60 nucleus, containing 33 neutrons and 27 protons, has an excess of 6 neutrons – shown in blue. 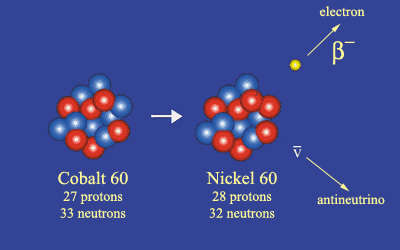 To even the balance, one of these neutrons transforms into a proton (shown in red) to form a stable nucleus of nickel 60 with 28 protons (one more than before) and 32 neutrons (one fewer than before). At the time of the decay, two other particles are created: an electron and an antineutrino which is able to pass undetected.